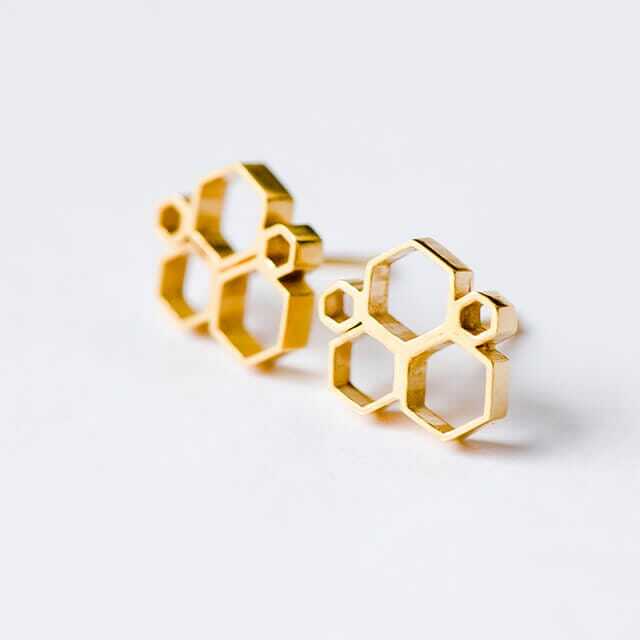 A charming honeycomb pattern stud earring that's easy to wear. Inspired by my interest in bees and the worldwide decline of the bee population these little earrings are a homage to the hard-working honeybee. I am a contemporary craftsperson and my work consists of mixed-media jewellery and small scale vessels with the occasional accompanying screen print. I specialise in the use of bio-friendly resins and frequently incorporate found objects in my work. After graduating from Edinburgh College of Art in 2007 I worked almost full time in arts administration with limited time to pursue my studio work. Despite this, I still regularly made new work and exhibited as much as possible, however in October 2014 I left full-time work to set up my own workshop and full-time artistic practice. I now make work for exhibition and sale from a ramshackle caravan parked at the foot of the beautiful Ochil hills in Scotland. My work is research-led and underpinned by a repeating theme of how we interact with the environment around us. My inspiration is often the space where the natural world and the manmade world collide. My current work is very much defined by this sometimes uncomfortable interface between man and nature as it examines the worldwide plight of the bee population; particularly the complex juxtaposition between bees as a part of nature (their history, evolution and biology) and bees as a commodity in our global agricultural economy. My pieces depict a dystopian future of modern consumerist 'nature' imagining what the world might look like if bees were to stop collecting pollen and instead focus their attention on collecting consumer goods.